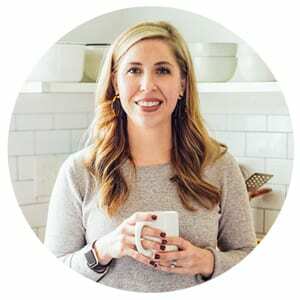 You may have noticed a certain trend here on Live Simply over the summer: The recipes containing a ton of fresh veggies and herbs took a backseat to meals that include more pantry ingredients. And this is for a good reason. Over the summer, our farmer’s market shut down due to the extreme heat in Florida. Nothing grows in Florida over the hot summer months, except plenty of bugs and tourists. Summer in Florida is much like winter up north. Last year I purchased most of my veggies and some fruits (fruit really isn’t our specialty in Florida, other than strawberries and oranges) from a local farm via their CSA program. I’m excited to share more about finding local produce and the concept of a veggie (and fruit) CSA in the guest podcasts that air next week. If you’re not familiar with a CSA, I recommend reading this post. In that post, I explain the concept of a CSA, the benefits, and how to find a local program in your area. Sharing in the bi-monthly produce harvest from this local farm taught me how to eat seasonally like never before. I’ve known about seasonal eating for a number of years now, but I’ve struggled when shopping at the store for produce. The moment the farm produce became our main supply for veggies (and some fruit), I was forced to embrace seasonal veggies and herbs. 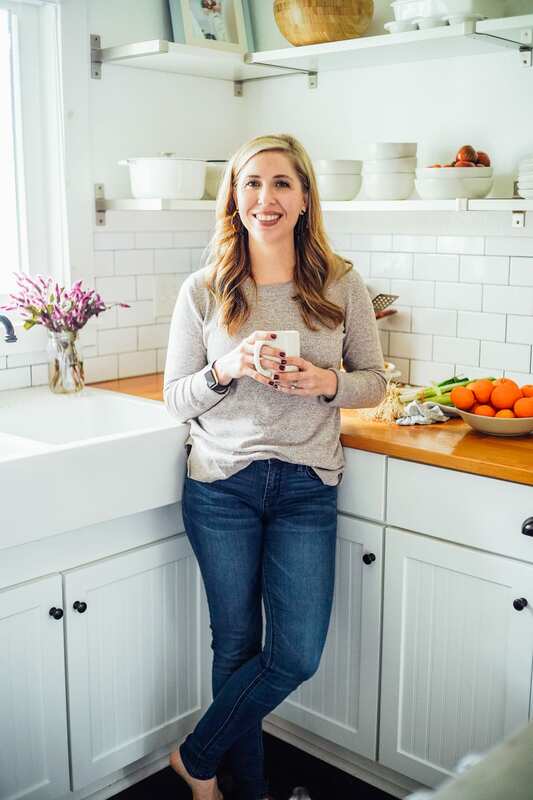 Over the course of nine months, I embraced seasonal eating and loved every moment. I learned basic lessons during this time, such as: tomatoes have a season, and they taste amazing during this season, and I should find all the ways to enjoy these tomatoes during that season. And when the season was over, I could pick up tomatoes from the store that had been shipped from across the country–which I definitely still do–but the tomatoes just don’t taste the same. With a bounty of local and super-fresh produce coming into my kitchen every two weeks, I felt inspired to make gorgeous salads and slaws, and use beets to make vibrant red smoothies, and turn cauliflower into tacos. I just haven’t felt that same level of inspiration since shopping at the grocery store this summer. That doesn’t mean we don’t consume veggies and fruits during the summer, which have been shipped from miles away (for which I’m so thankful). We’ve certainly enjoyed our fair share of tomatoes, cucumbers, greens, and even beets from Whole Foods, Publix, and other grocery stores in our area. But, there is something to be said for local, fresh, shake-the-hand-that-feeds-you food. There’s something so inspiring about picking up beets, leeks, sprouts, and a bounty of fresh herbs from a farmer that just picked the harvest yesterday. And there’s something to be said for the flavor and texture of this just-picked, locally-grown food. Needless to say, I couldn’t be more excited about the return of my favorite farmer’s market. I can’t wait to literally shake the hand that feeds my family for nine months out of the year, feel the inspiration that comes from picking up the bi-monthly harvest, and then enjoying the most delicious veggies (and fruits). October, I’m ready! In the meantime, I’ve found that seasonal eating means there are times when you have to rely more on your pantry for food. This summer, I’ve definitely been doing more of this. Eating from the pantry doesn’t mean eating overly-processed food. This simply means relying on jarred tomatoes (Jovial brand is my favorite) instead of fresh tomatoes or grabbing the dried rosemary and parsley instead of the fresh alternative. 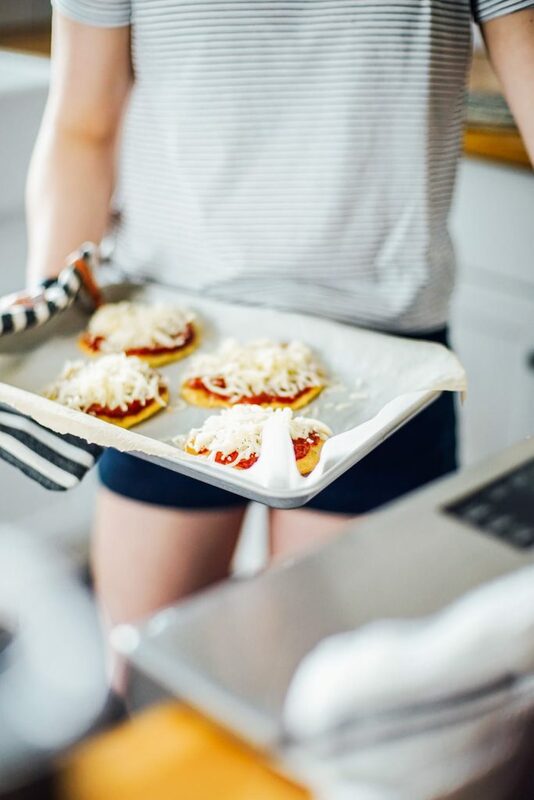 Today’s recipe is a “pantry recipe.” It’s a simple pizza recipe that calls for homemade einkorn tortillas (just einkorn flour, butter, salt, and water), spaghetti sauce (like this recipe or a simple-ingredient, store-bought option), mozzarella cheese, and olive oil. If you want to make the pizzas during market season, when local basil is growing, I would go with pesto as a base instead of the spaghetti sauce. Or, you could put a veggie-packed sauce spin on the base by using this veggie-packed spaghetti sauce. So many options! 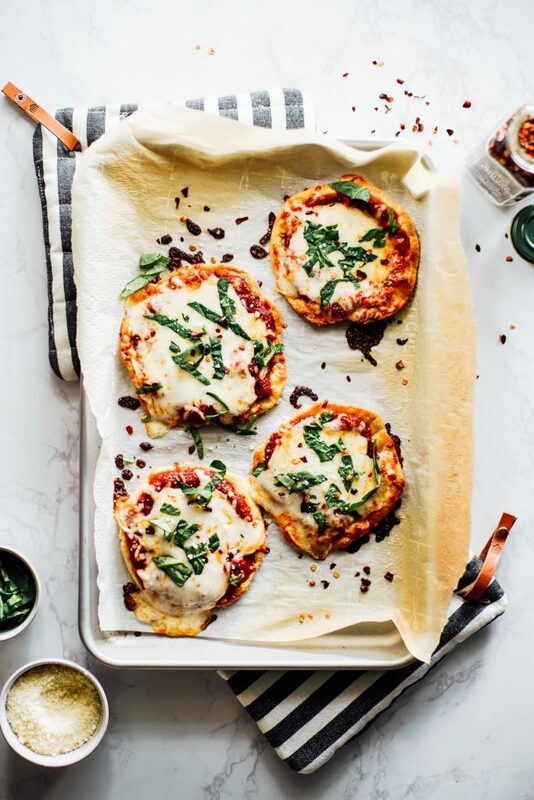 I’ve found these pizzas are perfect for a busy weeknight (serve with fruit, cut veggies, or a salad) or as a school lunch main meal. 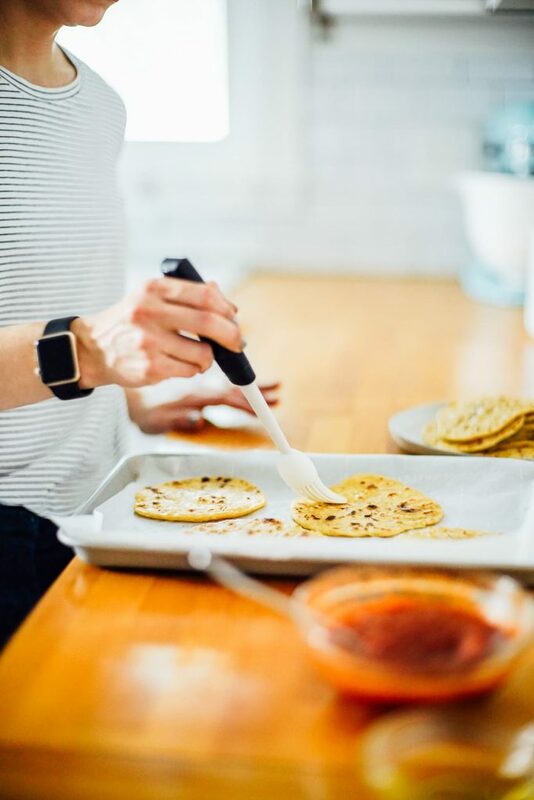 The tortillas take about 45 minutes to make, from mixing the dough to cooking the tortillas, so I recommend making a batch of einkorn tortillas (the recipe makes 18) on the weekend and freezing them (once fully cool) for later use. 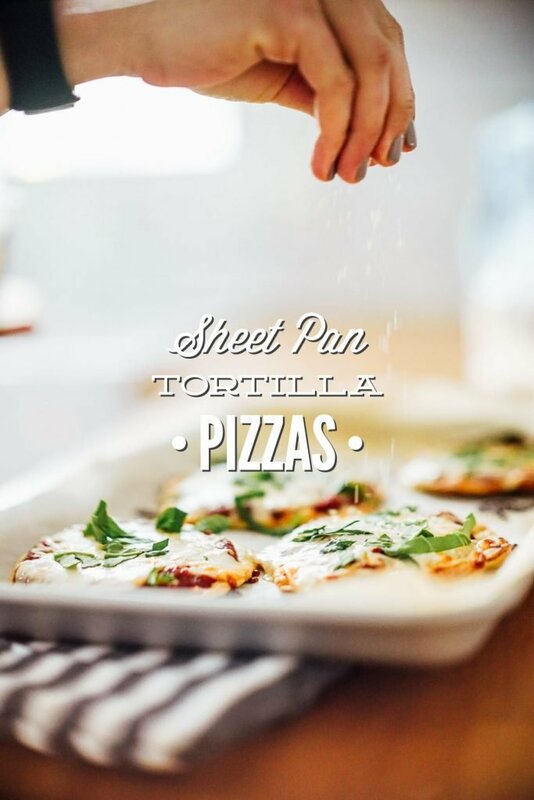 Defrost as many tortillas as desired to make this pizza recipe on a busy weeknight, for school lunch, or as a snack when the kids’ friends are over. 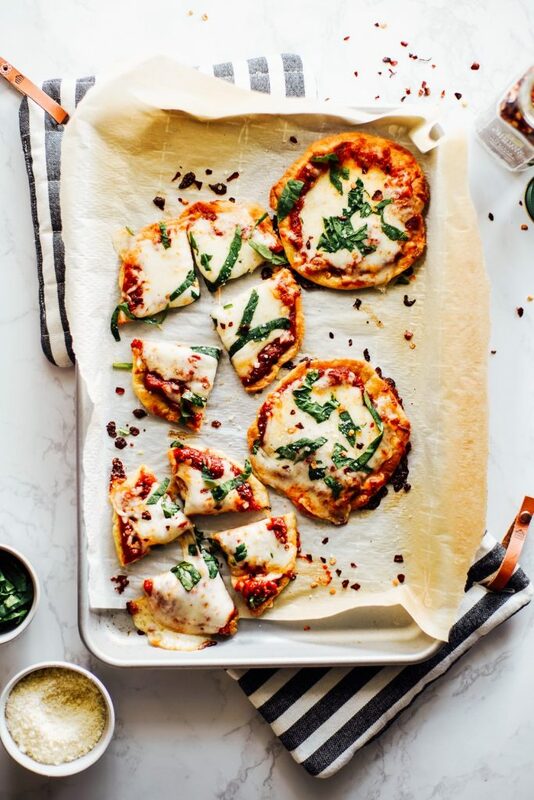 Maybe even set up a build-your-own-pizza bar at home with various toppings…so fun! 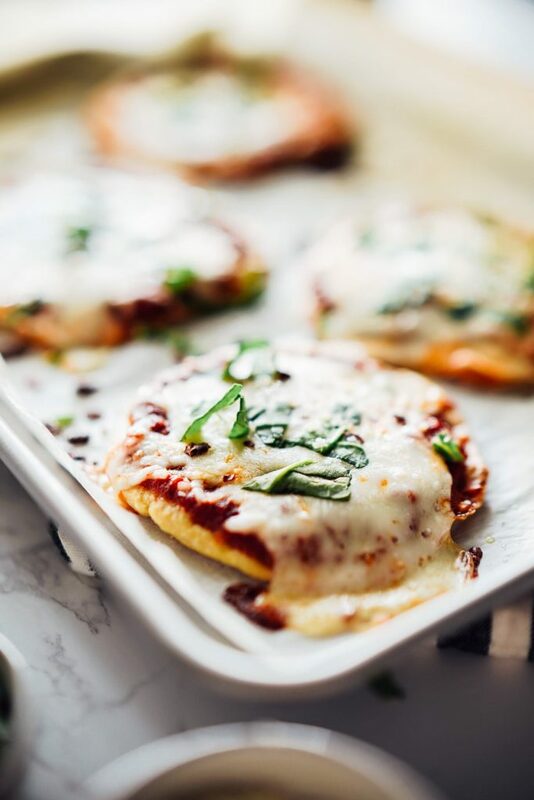 I've found these pizzas are perfect for a busy weeknight (serve with fruit, cut veggies, or a salad) or as a school lunch main meal. 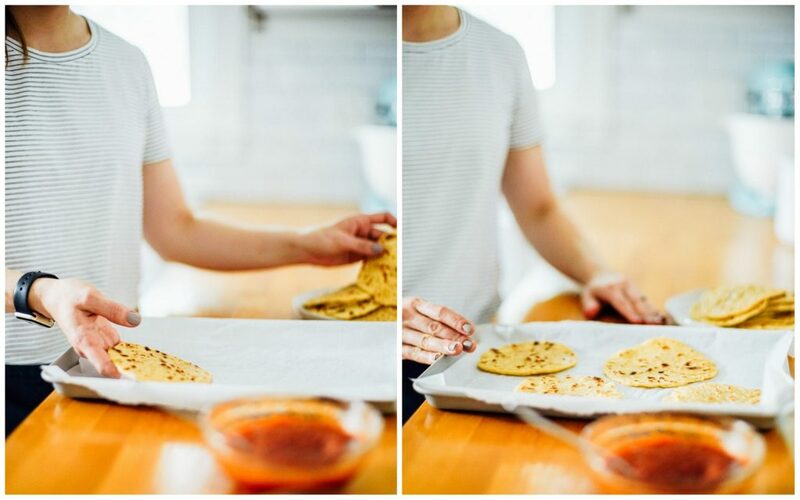 The tortillas take about 45 minutes to make, from mixing the dough to cooking the tortillas, so I recommend making a batch of einkorn tortillas (the recipe makes 18) on the weekend and freezing them (once fully cool) for later use. Preheat the oven to 400F. Line a sheet pan with parchment paper. 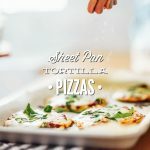 You may need two sheet pans to make 8 tortilla pizzas. Use the pastry brush to brush one side of each tortilla evenly with olive oil. Start with 2 tablespoons of oil in a small bowl, adding more oil as needed. Place the tortillas on the parchment-lined sheet pan. Bake the tortillas, oil side up, for 5 minutes. Remove the sheet pan (and tortillas) from the oven. Spoon the sauce evenly over the tortillas. Sprinkle each tortilla evenly with cheese. Finally, add any additional (optional) toppings desired. Bake the pizzas for 10 more minutes, until the cheese is bubbly and the toppings are soft (veggies) and hot. Allow the pizzas to cool for about 5 minutes before serving. Serve warm. You could probably make pizza with any tortilla of choice. I prefer the thickness and flavor of the homemade einkorn tortillas.